The United Nations Academic Impact Initiative will help the UN build stronger ties with institutions of higher learning around the world and leverage the resources of the global higher education sector to promote UN goals. This initiative is to develop and enhance the relationship between the UN and the global higher education sector by offering additional opportunities for academic institutions to be actively involved with the United Nations’ mission, policies and actions. It is also intended to expand the “convening forum” role of the UN Department of Public Information (DPI), which has worked well with other sectors of civil society, to the academic field. Participants in the Academic Impact Initiative agree to commit themselves to tolerance, diversity and dialogue as educational values, human rights, among them freedom of inquiry, opinion, and speech, educational opportunity for all people regardless of gender, race, religion or ethnicity, universal adult literacy, building capacity in primary and secondary education systems across the world, building capacity in higher education systems across the world, encouraging world citizenship through education, advancing peace and conflict resolution through education, addressing issues of poverty and health through education, and promoting sustainable through education. 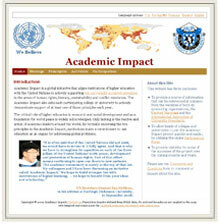 Faculty and administrators at Fairleigh Dickinson University have been pivotal in developing this initiative and were responsible for the original draft of the UN Academic Impact Initiative Statement. 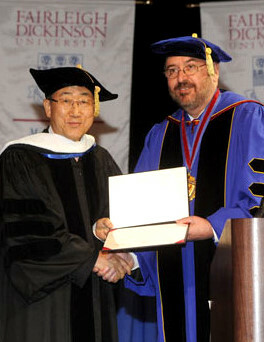 Fairleigh Dickinson University hosted His Excellency Ban Ki-moon of the Republic of Korea, the eighth Secretary-General of the United Nations, at the University’s Academic Convocation on September 10, 2008 where he was conferred an honorary Doctor of Humane Letters degree. In his address, "Thinking Globally in a Global Age" he discussed publicly the UN Academic Impact Initiative for the first time. "The path between Fairleigh Dickinson and the United Nations is well-worn indeed, to the benefit of both of us." "Your generation can help tip the balance in cultivating a global mindset. 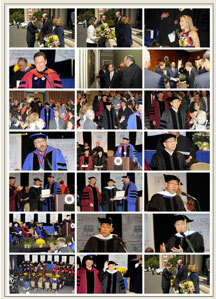 You are fortunate to be at Fairleigh Dickinson, because it is a leader in global education. Global education should not be thought of as an elective course -- or something to be added to a schedule once core requirements are satisfied." "My colleagues and I have been discussing an initiative called “Academic Impact”. We hope to build stronger ties with institutions of higher learning. I have discussed this matter with President Adams, and we hope to benefit from your ideas and scholarship. Fairleigh Dickinson University supports this initiative. My Under-Secretary-General for Public Information, Kiyotaka Akasaka, has had extensive consultations with Fairleigh Dickinson professors and others. I look forward to working together as we move towards the official launch of this academic initiative." "The visit marked an important milestone in our continuing partnership with the United Nations. I know the secretary-general was quite impressed with our entire University. He said he was very honored to be recognized by such a remarkable institution of higher learning, and he complimented our commitment to global education." "In his address, the secretary-general drew attention to critical challenges facing the international community such as global warming and spoke of the importance of global education and world citizenship. He also discussed publicly for the first time the development of the U.N. Academic Impact, which will bring together universities committed to the goals and values of the United Nations." Students from both of Fairleigh Dickinson University's New Jersey campuses were present at the Secretary General's speech and provided him with an enthusiastic reception. In this video, Secretary-General Ban Ki-moon announces the United Nation Academic Impact initiative.